Detour Whey Protein Oat Blend [(Rolled Oats, Whey Protein Concentrate, Whey Protein Isolate, Hydrolyzed Whey Protein), Calcium Caseinate], Vegetable Glycerine, Milk Chocolate Chips [Sugar, Cocoa Butter, Chocolate Liquor, Milk, Soy Lecithin, Vanilla Flavor], Inulin, Chocolate Cookie Pieces [Wheat Flour, Sugar, Canola Oil, Cocoa (processed with Alkali), Salt, Sodium Bicarbonate], Water, Soy Protein Isolate, Gelatin, Natural Flavors, Mono and Di-Glycerides, Potassium Sorbate (as a Preservative), Vitamin E (as Mixed Tocopherols), Sucralose, Neotame. You may be tough and gritty, but your protein bar shouldn't be. 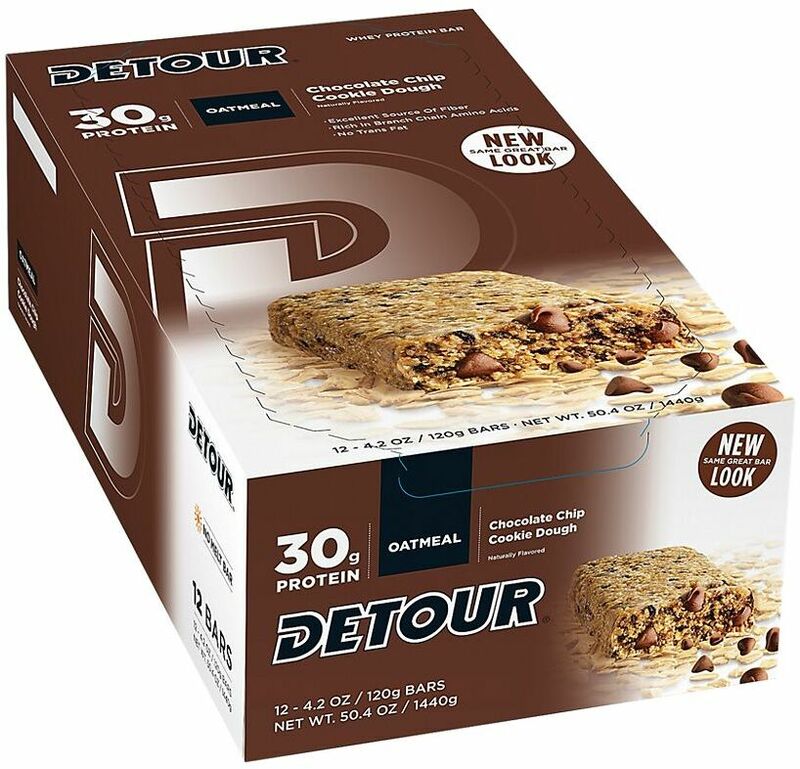 Detour Oatmeal is a smooth, delicious blend of whey and wholegrain oats that delivers an unbeatable combo of fiber and protein. We've taken all the great taste of the best selling whey protein bar, and combined it with all the whole grain goodness of oatmeal! Detour Oatmeal delivers 30 grams of high quality protein - powered by Detour Whey. Giving you long lasting energy and helping your body rebuild and recover from you daily activities. Enjoy Peanut Butter, Chocolate Chip, or Peanut Butter Banana. Take a Detour to a new state of taste and satisfaction today.